Saint John Bosco, affectionately known as 'Don' Bosco was a man ahead of his time. He was wholeheartedly committed to poor and troubled youth and revolutionised educational practices and approaches to youth spirituality by harnessing the power of peer-mentoring and meeting young people in activities where they were most comfortable. At a time when teacher and student were expected to remain distant from each other, where discipline was rigid and punishment harsh, Don Bosco modelled his educational system on an extended family where good and Christian learning was to happen in an environment of familiarity, spontaneity, trust and joy. He felt that the key to forming good citizens and good Christians was in loving relationships, lived out through the use of reason, religion and loving-kindness. He founded the 'Salesians of Don Bosco' and the 'Daughters of Mary Help of Christians'. 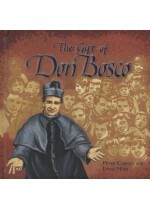 Their work keeps Don Bosco's dream alive all over the world. His gift is that of genuine hope for youth in an ever-changing world. Challenged by reality, inspired by dream–visions, animated by his enduring closeness to God, he responded innovatively to gift the young with a sense of realism and hope through joy-filled practice of their faith. He responded to the particular needs of his place and time but left an attitude and system geared for adaptation to the future. and will be added at checkout. If you purchase more than one book, shipping is based on the total weight of your order. Delivery charge includes Parcel Mail with a Tracking number. For orders over 5kg in total or delivery outside Australia, please contact us first for a delivery cost.